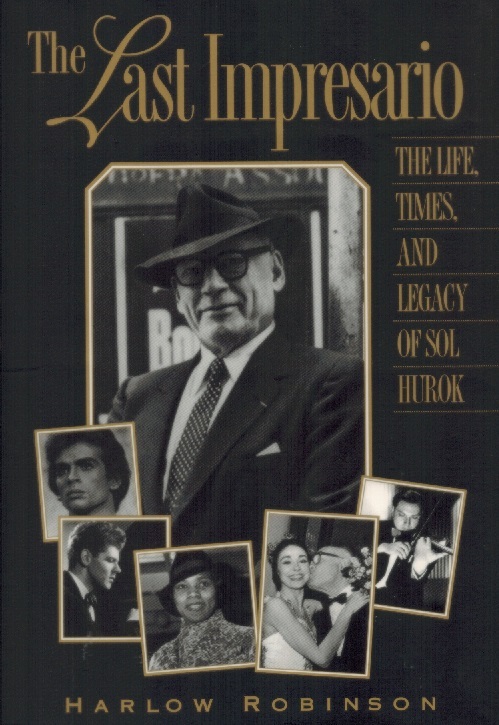 “A master of self-invention, Sol Hurok remains an enigmatic figure even after Harlow Robinson's exhaustive account of his subject's astonishing career, THE LAST IMPRESARIO: THE LIFE, TIMES AND LEGACY OF SOL HUROK. Although the author is reasonably certain that Hurok was born in the small Ukrainian town of Pogar in 1888, emigrated to America in 1906 and had, within a mere five years, achieved a modest success supplying performers for various public events, ‘reasonably certain’ are the operative words. The only absolutes in this diligent biography are the accounts of the great performers he introduced to America under the magical heading of ‘Sol Hurok Presents’. Virtually everything else about the man is open to discussion, even the location of his birthplace, ‘a town of no importance’ on the Sudost River in Ukraine. ‘Or was it Ukraine?’ Robinson asks, doubtful even after he made a pilgrimage there. Although Hurok delighted in blurring the facts of his early years, revising everything from his precise birth date to the number of his brothers and sisters (18 in all, 9 of whom survived), we do know that the original family name was Gurkov, changed, like so many others, by immigration officers who found Hurok more manageable. Once the cursory formalities were completed - at Castle Garden, as Hurok said, or Ellis Island, which seems more likely, because Castle Garden was the site of the New York Aquarium by 1896 - the young man from Pogar (either 14 or 18) was already transformed into Sol Hurok, which is really all that matters. In 1908, he married Tamara Shapiro, the mother of his only child, Ruth Hurok Lief, who contributed to this project but admitted that she has never been sure if her parents were married in Russia or America. Eventually, Hurok divorced Tamara and married Emma Perper, a glamorous Russian cabaret performer who was both a widow and a divorcée. But even the details of Hurok's second marriage ‘remain murky, like so many details of his private life’. One must admire Robinson's perseverance in the face of such confusion. A less determined biographer might have abandoned Hurok and chosen a subject with a more demonstrable history. Instead, the author soldiers on, qualifying all disputable statements about Hurok with conditionals, tiptoeing around personal information as if Hurok's life were booby-trapped, which in a sense, it was. When 20th Century Fox made the movie of his life, TONIGHT WE SING, Hurok insisted that the script established immediately ‘that it is the story of a successful man’. A chronicle of professional triumphs, the film was entertaining but hardly informative. 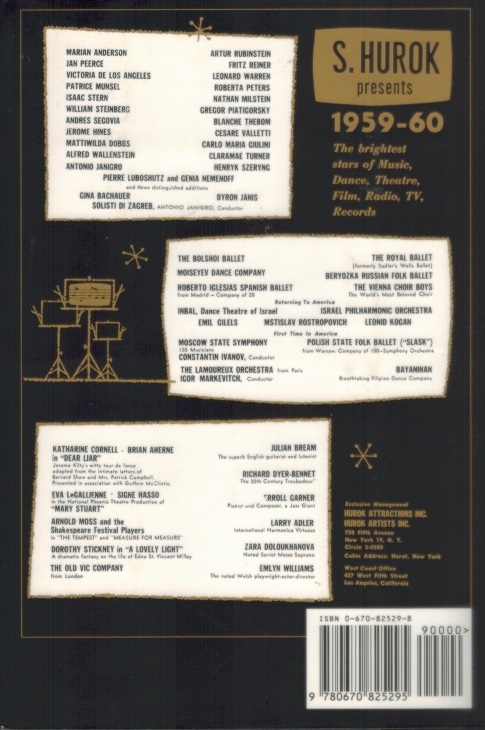 Despite all of Robinson's research and interviews with scores of celebrities who knew Hurok and were his clients, this book, like the film, inevitably becomes a list of the great impresario's presentations. That list, however, is unparalleled, including Anna Pavlova, the first dancer to arouse America's interest in ballet, and the Russian operatic sensation Chaliapin, both captured by Hurok early in his career. Later he would introduce Isaac Stern, Arthur Rubinstein, Marian Anderson, Jan Peerce, Shostakovich, Rostropovich and scores of other justly celebrated musicians and dancers. His early success with Pavlova encouraged Hurok to import Margot Fonteyn and Rudolf Nureyev. That triumph with classical ballet encouraged him to present the innovative dancers Isadora Duncan, Martha Graham and Agnes de Mille. Enamored of the art form of dance, Hurok was solely responsible for the U.S. appearances of the Ballet Russe, the Bolshoi, the Kirov and, eventually, for bringing the entire Moiseyev ensemble. Emboldened by the reception these performers received, he also attempted to interest U.S. audiences in national theater groups and opera companies, although the response was less ecstatic. In 1925, Hurok declared bankruptcy after losing substantial sums on Chaliapin's opera company and Moscow's Hambima theater. But as Hurok's friend Jan Peerce commented, the Huroks of this world wind up ‘on their bottoms higher than most people ever rose’. The bankruptcy may have caused Hurok to miss a few beats, but he soon rebounded, providing high culture to a country in the depths of the Depression. Throughout the next three decades until his death in 1974 - the single indisputable date in this remarkable life - Hurok continued to amaze and delight the American public.